Dare I ask what the tearsa were for and were they crocodile or true ones? Oh no. I dare anyone to come on here and not instantly do an 'awww'. She's gorgeous even when crying! Agree with Tara - a stunner even when blubbing! I did '3', and the Xplory makes an appearance... wanna see? Oh that bottom lip! 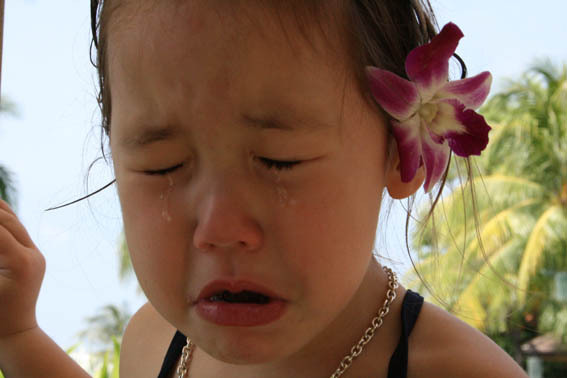 For some reason pictures of crying babies always make me laugh (I am a mean hearted whatsiname?) It is the expressions on their faces. Oh it is an amazing photo...how you got those tears I don't know and she is so gorgeous. I hope the tears didn't last too long. I really love this pic and yes - it amazes me that she can still look so stunningly beautiful even mid strop. But then it usually is when you are 4! Ah, poor little thing. She still looks gorgeous though. This is so cute, so many tears!